We get the best deals because we match a coupon with a sale. 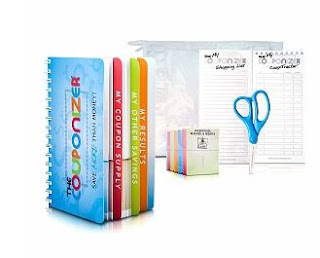 The downside to this is that many people often get frustrated because they do not have a system for organizing their coupons. We are here to help! I've teamed up with Shopper's Haul and several other great bloggers to give away a Couponizer Coupon System to one lucky reader! The winner will be able to start 2012 with a coupon organizational system in place that will help save a lot of money! To be entered in the giveaway, complete the entries on the Rafflecopter form below. Entries will be verified and no duplicate entries will be allowed. This giveaway is open to U.S. residents and ends on 12/24 at 12:01am. GOOD LUCK!